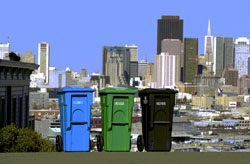 San Francisco gives each home 3 bins. Blue is for all recyclables (and we can recycle loads of plastics, glass, metals and papers), Black is for trash and green is for compost. Since we've been using the green bin we have reduced our black bin contents tremendously. The thing about San Francisco compost that is unique (besides the fact that they pick it up from you) is that it accepts meat scraps. I don't know how they process it into compost exactly, but I do know that lots of local farmers and vineyards are using it. It is making a great, local, full-circle story.